All-or-nothing eating– You’re on a diet, then you’re off it. You’re eating perfectly, then you throw in the towel. In this post, you’ll learn 3 ways to end this unhelpful cycle that ultimately leads to weight gain. It’s 3pm and my stomach has staged a protest for my 3:30 snack. I count out precisely 9 almonds. Not 8. Not 10. Exactly 9 almonds. Because my diet said so. I ate them but then I wanted more. What’s a girl to do? Have you ever eaten 12 baby carrots? How about 1 teaspoon of nut butter. Popular diets tend to enforce strict guidelines that don’t have a ton of flex for real life. Can you imagine feeling like a failure because you ate 14 baby carrots? I can and I have! So, if you have been on a diet, just about any diet, there’s no wonder why you may have a little all-or-nothing eating happening. When a great day is dissolved by one food infraction, you may be a certified “diet perfectionist.” Not to worry, there is hope. Here, I’ll give you a few examples of the all-or-nothing eating mindset, so you can see where you stand. Then we will talk about why this tendency may exist in your life. And, I’ll send you away with some super-practical tips that you can put into practice right away. 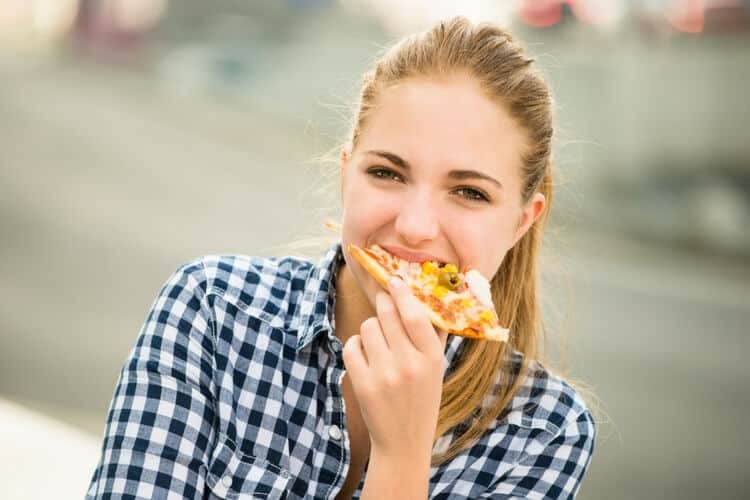 I have worked with hundreds of “near-professional dieting” women, and all-or-nothing eating plays out rather predictably in each of their lives. Have you ever found yourself in a similar scenario? It’s lunchtime and you are meeting a friend for lunch at a local cafe. Earlier in the day, you had a nourishing breakfast and now you’re set on ordering a salad, with an apple instead of bread, of course. Your order comes and there is a warm baguette perched between lettuce leaves. You shrug it off and determine not to eat it. But, as the conversation lasts beyond your bountiful salad, you start picking at the bread. Before you know it, it’s gone. Your diet day is ruined and you decide to eat whatever you want and start again tomorrow. You are feeling great about your health and fitness efforts. You are getting stronger and your clothes are fitting better. It’s Monday morning, your weigh-in day, and you step on the scale. Much to your horror, you have gained weight. Ugh! This news crushes you and you spend the rest of the week veering off course because surely your hard work didn’t matter. It was a hectic day and you hardly had any time to eat. Well… there was the banana you grabbed on your way out the door and you did manage to find a granola bar in the bottom of your purse. You pick the kids up from school and head home, famished. As soon as you walk through the front door, you make a beeline to the pantry. You eat more than you wish and now you’re not hungry for dinner. Dinner time comes and you decide to eat anyway because you already”blew it” and it’s “too hard.” And, the eating continues through the night. Each of these situations shows how diet perfectionism can cause us to lose our senses. We all know that eating more than we had planned is not undone by eating even more. We know that progress takes time, that our efforts do matter, and that something is better than nothing. Yet, perfectionism can throw off even the most logical mind, leading to less progress and lots of frustration. I call these diet side effects. Contrary to what you may assume, a way of thinking does NOT have to be logical to be personally meaningful. If you were bitten by a dog when you were young, you may fear all dogs. Even though you know that the elderly golden retriever being practically mauled by passing children would do you no harm, you still feel compelled to cross the street. In the same way– if you feel like less-than-perfect eating is a true infraction, you need to acknowledge the power of this mindset. Then, you can work through your preconceived ideas to overcome them. Here, we’ll look at 3 of the reasons we may hold on to such beliefs below. In the bigger picture of our lives, perfectionism can be a way that we look to prove that we are “good enough,” worthy, and even loveable. Getting straight A’s or being the employee of the month is awesome, but when our value is determined by our acquisition of such things, we’re standing on shaky ground. The same perspective can spill over into our food choices. If we can just get our diet right, then we’ll finally lose weight and become the confident and popular person we’ve always wanted to be. The truth is, we will never be “good enough” without the saving and sanctifying work of Jesus Christ on the cross. Our failures are expected by God and intended to point us to Christ, as we praise Him for being the Perfection that we can never be. 2. IT’S AN EXCUSE TO DO WHAT WE REALLY WANT TO DO. Are you familiar with the popular children’s poetry book by Shel Silverstein, A Light in the Attic? 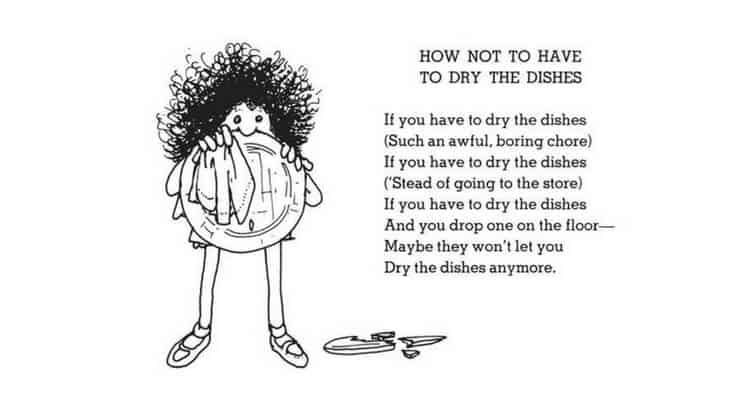 In the poem “How Not to Have to Dry the Dishes,” a little girl purposefully drops plates on the floor, hoping that the dreaded chore will no longer be hers. Much like this little girl, a perfectionistic, all-or-nothing eating attitude towards our diets can be an ideal excuse for going off the very diet we don’t want to be on in the first place. Now, this may not be a conscious thought process. But, if the only time you are “allowed” to eat some of your favorite foods is when you break your diet- my friend, you are going to break your diet. The truth is, we are always free to eat what we want to eat when we want to eat it. We have the freedom of choice. Using perfectionism as an excuse only shifts the “blame” and keeps us from acknowledging our choice to indulge. 3. WE WANT TO BE IN CONTROL OF SOMETHING… ANYTHING! 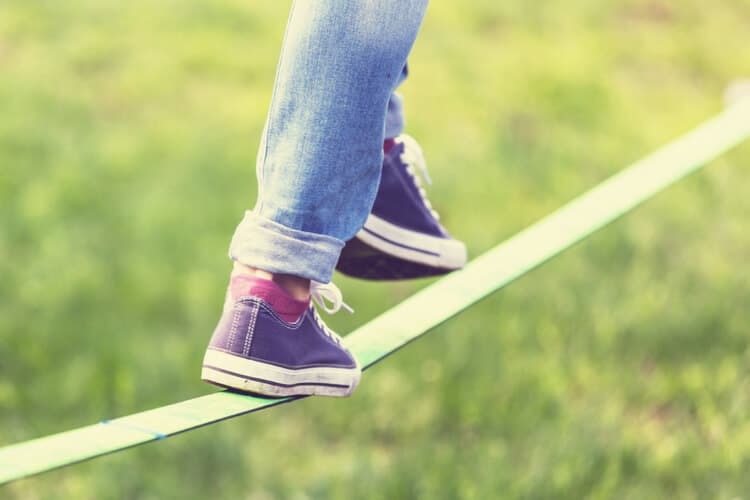 When life feels out of control, it is only natural to try to take control of those things that are in close proximity to us. Food is within arm’s reach. We may subconsciously feel that if we can’t get our work, our family life, or our relationships just right, at least we can feel good about our food choices. Or, maybe we believe that controlling our diet and reaching our weight loss goals will be the magic answer to finally fix all that is awry. If not, at least we tried. The truth is, only God is in control. No matter how quickly our lives are spinning around us, our very existence is perched in and sustained by His hand. The Bible tells us that nothing can happen without the Lord’s permission (Lamentations 3:37). Our attempts at control will only exhaust our ever depleting energy. Unfortunately, for most dieters, the expectation is ONLY to land on the moon. Skim any diet book and you’ll see what I mean. Trying to nail a “perfect” diet is a recipe for food stress, rebound overeating, and ultimately weight gain. This is because setting unrealistic expectations that are inflexible never works– especially when it comes to something as necessary, daily, and emotional as food. When inevitable mishaps are met with all-or-nothing eating rather than constructive learning, the cycle never ends. If you are beginning to see diet perfectionism as detrimental, I bet you’re wondering what to do next. You’re probably aware that you can’t just flip a switch to change your mindset, but goodness! you wish there was a quick fix. Yes, it will take time but there are a few shortcuts you can take! 1. Keep your eyes and ears open for diet perfectionism. 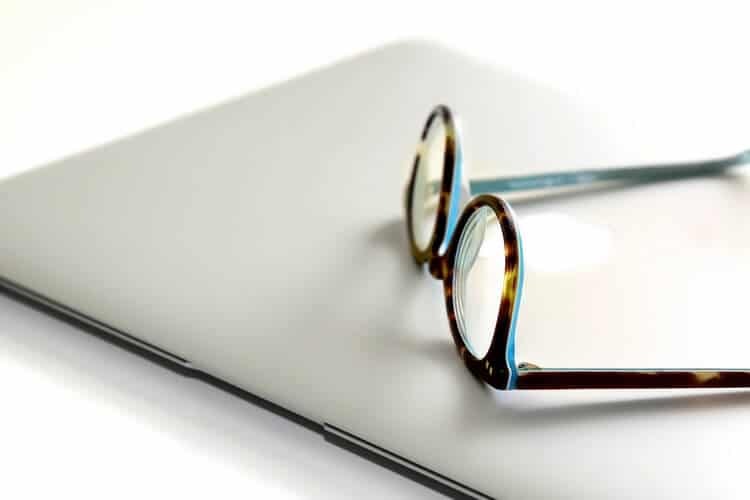 In your daily life, put on your detective’s hat and become keenly aware of all the times that the perfectionistic voice slips into your thinking. Sometimes it will be obvious; often it will be sneaky-sneaky. 2. When you notice the diet perfectionism voice and behaviors, don’t try to stop them. You heard me right. Just like a diet that bans bananas makes you crave bananas like a crazy woman, trying to stop an all-or-nothing diet mindset will only make it more sticky. Simply notice what’s happening and observe it, as if you were watching the scene play out on a movie screen. 3. Gently move your mind to your new truth. If you no longer believe that eating one cookie is a reason to eat 12, rehearse your reasons why. Make a case and use this opportunity to encourage yourself to make a better choice. All-or-nothing eating tells us that tomorrow, Monday, or New Year’s is the best time to restart. However, if you no longer believe that it’s all-or-nothing, then you can restart any hour, any minute, or any bite. Put the past in the past and move into the now– the only time we can actually modify our behavior. What does stepping away from all-or-nothing eating look like? I am glad you asked. It looks like making a “mistake” and moving on. It’s 3pm and you just ate half of a leftover donut in the office breakroom. It was a stressful day and the afternoon slump had left you with your guard down. As soon as the last bite of sugary sweetness crosses your lips you hear it- the diet perfectionism voice reprimands you for “ruining a good day.” It’s blown you think, you may as well grab some M&Ms from the vending machine. You pause and you notice that voice. “Wow,” you think to yourself, “isn’t that interesting.” Just a few minutes ago you were set on honoring your hunger and fullness and now suddenly that idea is out the window because of 125 calories of a donut. Something you read resonates through your mind and you are reminded that eating more won’t undo a small dietary detour. Surely, you want to eat more, but you really don’t want to keep stuck in this cycle. You look at the clock, it’s 3:10pm and you start your day, fresh again! As you can see, the pull to diet perfectionism is a strong one for those who have dieted in the past. When you went on your first diet you didn’t imagine yourself dealing with the consequences years later. Now you see it. But, now you know better and now you can do something to change it once and for all by bringing in mindfulness and gentle redirection. Please be aware, it would be easy to get perfectionistic about not being a diet perfectionist. Don’t go there. Rather, let yourself slowly change your way of thinking, for good. This is the way of permanent change. Be kind to yourself as you learn… and if you eat more than 9 almonds, it will be ok! If you need help creating healthy habits in a way that doesn’t lead to all-or-nothing eating, check out The Ultimate 12-Week Healthy Habit Goal Setting Planner. Tears filled my eyes as I read your words. I am in the process of switching my mindset. I have been a successful professional dieter a lot of my adult life. More recently, I have found that I can’t do this on my own anymore. God loves me too much to let me do this on my own and freedom is His gift. Thank you for so eloquently putting my struggle and desires into words. ❤️ I no longer want to live the all-or-nothing lifestyle! Hi Penny! My heart and prayers are with you now. I’m happy to hear that you’re ready for more– to be led by the Spirit and to bask in His grace. 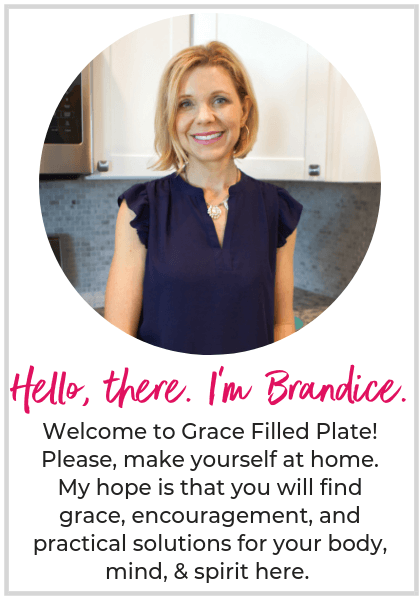 Drop a line if you ever need a listening ear (Brandice@GraceFilledPlate.com). This was Very interesting. So true. Good read. I want to save this and remember this. I’m so glad you found it helpful, Joyce!